I love satay in all forms and eat it frequently when I’m in Thailand – alternating between beef, chicken and pork. I just can’t get enough of it. The dishes vary quite a bit from restaurant to restaurant – different marinades, different-shaped kebabs and most importantly different-flavoured dipping sauces. 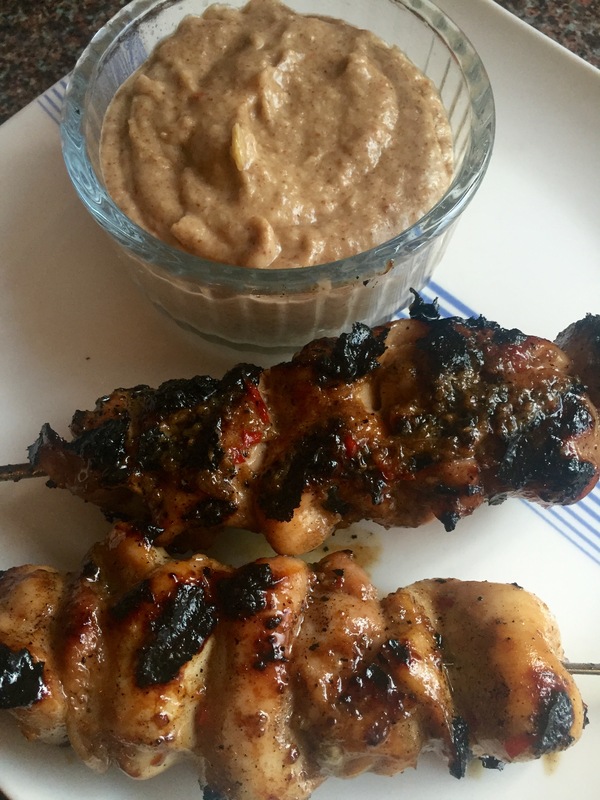 So I’ve been experimenting and come up with a truly tasty chicken satay. The marinade makes the kebabs so sweet and moist as well as adding a spicy bite and the sauce tastes really nutty and indulgent. 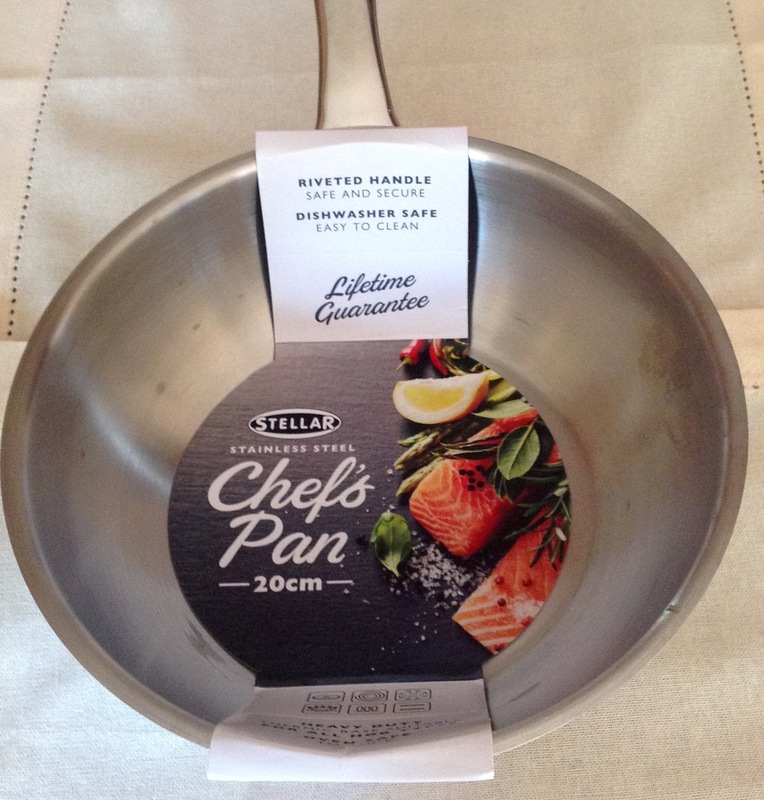 I used my fabulous new Stellar Chef’s pan to make the sauce – most definitely are a pleasure to cook in. Read more about it and where to get one below. Slice the chicken thighs into three equal, long pieces. Mix together the ingredients for the marinade and add the chicken. Make sure it is well coated. Leave covered in the fridge for at least two hours. Just before cooking thread the long slices of chicken onto the skewers, folding them. Remember to soak your skewers if they are wooden so they don’t burn. Grill or barbecue the skewers for about 10 minutes on each side, turning and basting regularly with the marinade. 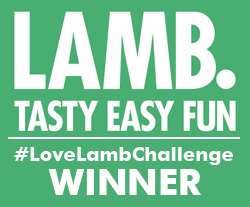 You can make the sauce way ahead and keep it in a jar in the fridge – in fact it will last a few weeks, if you can resist eating it for all that time, that is. Heat the coconut oil over a medium heat on the hob and add the onion, chilli and garlic. Cook for about 10 mins until nicely softened. Add the peanut butter and honey and stir thoroughly making sure it doesn’t stick. 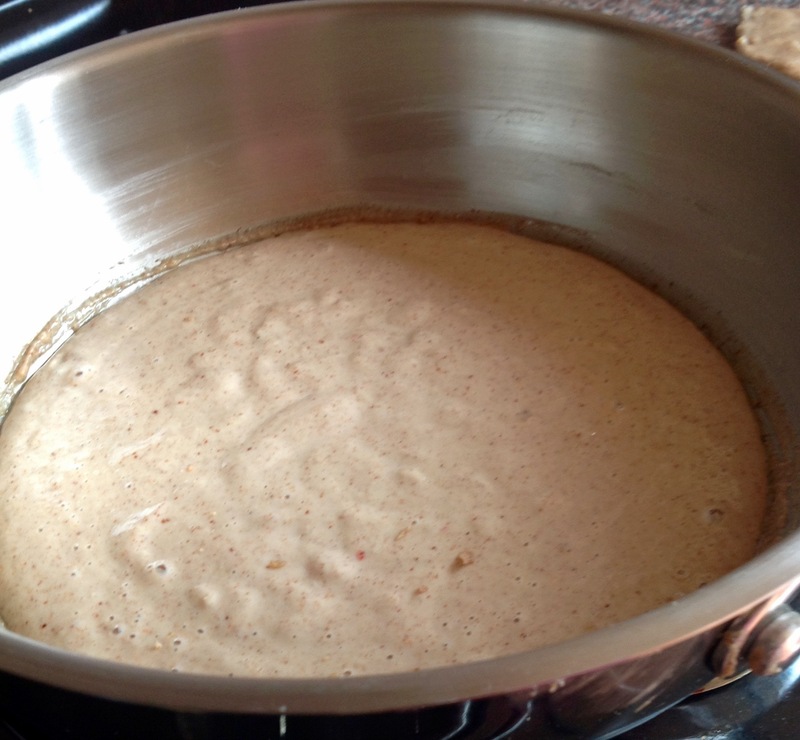 This will only take a few minutes to melt and blend together. Allow to cool a little and transfer to your blender. Add the coconut milk and blend. I made my sauce in this Chef’s pan from Stellar. It’s suitable for all hobs, dishwasher and oven safe and a pleasure to cook in with its non-stick surface and flat, wide base and tall sloping sides. 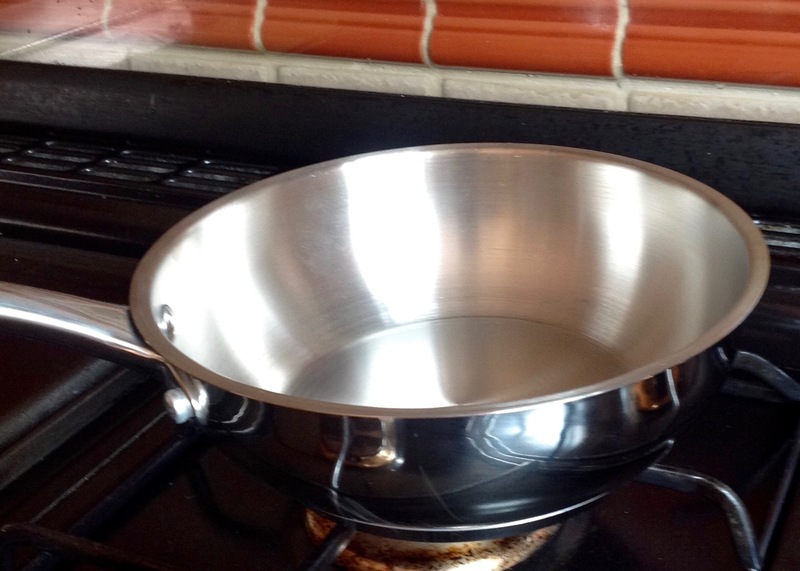 The pan comes in three different sizes with prices starting from £20 for the 16cm one. I served my satays with a simple salad using ingredients I had in the fridge and made a zesty dressing using fresh lime juice, chopped chilli, fish sauce and sugar. 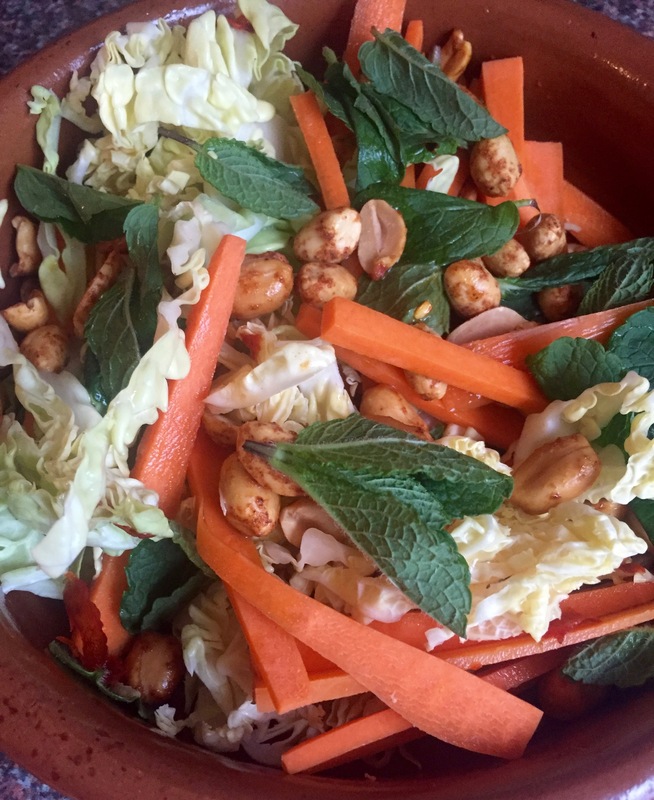 Simply chop cabbage, cut carrots into batons, top with mint leaves and dry roasted peanuts and pour over the dressing. Definitely going to make all of this. Yum! !